Over the past several decades, unions have been increasing their clout in political elections. Between 2012 and 2015, unions gave $529,952,862 to various political, economic, media, and special interest organizations. The 2016 election meanwhile saw an uptick in election spending as unions increased their spending by 38 percent as they came out to support Hillary Clinton. There is of course nothing inherently wrong with union support for political candidates as it is protected by the first amendment. However, the problem is that while union leadership came out in droves for Hillary Clinton, union households came out in support for Donald Trump. Trump actually significantly closed the gap between himself and Clinton as more union members came out in support for him than they had Romney. This throws how representative union leadership is of its member’s needs into serious question. In addition, Union elections need some level of reform. At the moment, about 94 percent of union members never actually voted to be in a union. In addition, there have also been accusations of union harassment against employees because between 2000 and 2007, “thousands of unfair labor practices cases have been filed against unions...including 1,417 for coercive statements, 416 for violence and assaults, 546 for harassment, and 1,325 for threatening statements.” This draws the legitimacy of their creation into question as well. Fortunately, the ERA does offer ways to address these questions. First and foremost, it makes all votes to unionize or strike secret. This would make union coercion of disinterested employees harder. It would also prohibit the use of coercion of workers and criminalize threats. This would greatly cut down on the harrassments discussed previously. It would also be a great defense of employees' rights. Finally, it would also require majority vote from all workers for representation, put unions up for repeated recertification, and prevent unions from using dues for political causes outside of collective bargaining that union members do not support. This would increase union accountability and make them more responsive to their members. There is actually strong support for the legislation among both union and non-union households. The principles of the legislation are supported by both from anywhere between 60 percent to 80 percent. 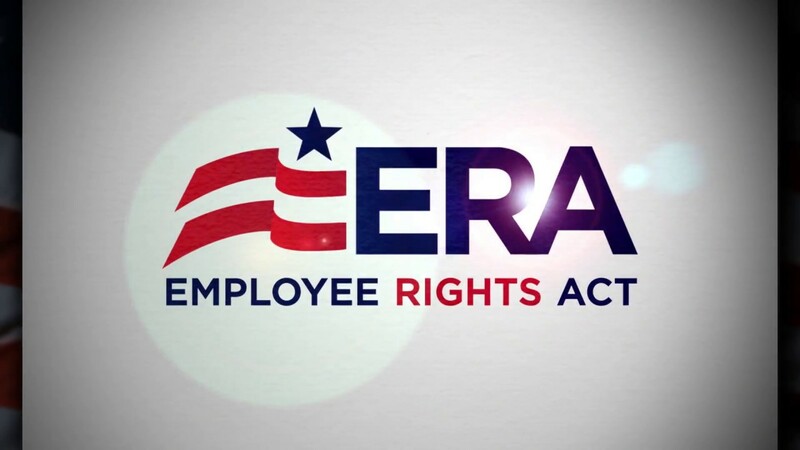 Overall, the ERA is a popular way to increase accountability, reduce harassment, and prevent coercion.